The vineyard this year has been a real challenge. We are experiencing what seems to be the worst summer weather we've had since I planted in 2001. Non-stop cloudy, cool and rainy weather here in the Northeast US. July has been terrible and I've been fending off downy mildew and rot all summer long. I've been trying to keep the canopy very thin but it's been difficult. I'm still keeping up hope for a hot sunny August and September. I hope your vintage is going well in your vineyard. I'll post some pictures and updates soon. I still have hope for a good vintage though. If worst comes to worst and the grapes don't ripen well enough for red wine, I'll make lots of good rose'. I read the article last night and it was wonderful. Great job. It was a nice break from trying to battle this daily deluge of rain. Thanks! I'm with you on the rain. I'm keeping my canopy very thin this year. We'll see what happens. Let's hope for a hot dry August-October. All the best! I just noticed downy mildew on a couple of my vines. I have thinned their canopies, but it wasn't too crowded bad to begin with. Do you think I should spray at this point? What happens if I don't? The leaves and canes don't appear to be suffering too bad, and I'm not concerned about the crop this year, although I don't see any problems with the grapes. Also I seem to have some foliar phylloxera, but I understand there isn't much I can do about that. I appreciate your advice. you should spray. If you don't the mildew will continue to spread and cause damage. Moisture and humidity will cause downy mildew to spread and downy usually shows up before other diseases like black rot or powdery mildew. I don't like to spray and do it as little as possible, but in a year like this if you put it off you can have problems that will continue on because these diseases overwinter and will show up again next year. Don't worry about the leaf galls, sometimes I squeeze them flat to kill the phylloxera larva, but I don't know how much that helps if at all. But it makes me feel better! I went ahead and sprayed. Have a good week. Great article! I have already referred back to it a few times. I am in the first year of establishing my backyard vinyard and am running into my first few problems. 1) I seem to be getting some black rot developing on my riesling and vidal. I have young children so want to use the least toxic spray. I have heard that a milk based spray can be effective - any recommendations? I have also noticed that despite ensuring that the graft union is at least 4 inches above the ground some of the roots are starting to break through the wax. What is the best way to address this issue? Thanks for stopping by!Black rot is a problem and can be very prolific if you don't control it. I don't have any experience with milk based sprays but I do understand how you feel as I have two young daughters myself. I have experimented with organic controls and did so for a whole season one year. Unfortunately they did not work for me and I had a very poor crop that year and a lot of damage. I have since worked to find the minimum amount of spray I can use and compensate with a very open canopy. My girls also know that the vineyard is off-limits for two days after a spray and I monitor that. That may be extreme, but I feel better that way. And I never spray on windy days. As for the scion roots, just cut them off or pull the off with your fingers. That wont harm the vine at all. Make sure you do it though, you don't want to defeat the purpose of your grafts. 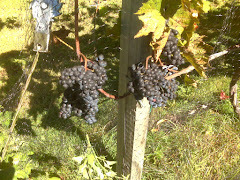 Best of success on your vineyard! Are your grapes starting to ripen yet? I have my first concord I started a couple years ago ripening and I am going to have a pretty good harvest. Well for one vine anyway. Oh well the others are growing well. Its been terrible here in MN. Cold and rainy. I had a question about winterizing. I noticed that you hill up your vines. Can I accomplish this by using potting soil, only seven vines. Our ground is mostly clay and hard to dig up. Can grass clippings be used for insulation or would this cause more damage than good to the vines. Thanks and keep up the great blog. Sorry for the slow reply. The grass clippings and potting soil could be used. The thing is you need to make sure you get the graft union covered well with a good 5-6" of soil, etc. That's why I use the sod around my vines. It is dense and thick so it has a good r-value. Best of success! Hi Dave! 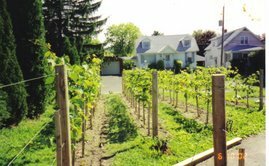 My husband and I are starting a small winery with our farmland in north Jersey. Thank you for your blog! I am going out shorty to hill up our 1st year grafted vines. My concern is the winter wind effect on the canes. The are so precisou to me! :) My babies! haha The wind by us is pretty constant and the west to east curent can be very strong at times. We decided not to use tubes, and I thnk it is too late for them now. Any thoughts?? Thank you kindly in advance! Congratulations on starting your winery! Well, I have never had wind affect any matured canes in may vineyard. Usually ambient temperatures are the concern. However, I don't get the kind of wind you are describing, so I really can't say what might happen. Just be a little careful of the graft union, don't bend the vine there. But they should be fine, I've done it many times and never had any problems. Then just remember to uncover the vine in early spring, as soon as the threat of damaging winter lows is over. Hope that helps! I Wish you lots of success! So, you, in the past, have let your 1st year canes stand straight up with a hill of dirt at the base and no problems during the cold NE winter? I hill up my vines in Missouri. I purchased a Green Hoe from a company in the Finger Lakes. It works great, I broke it three times by hitting some roots but took it off and had it welded for better. Sorry, my url is www.amigoni.com and i am winemaker for urban winery in kansas city, labels: Inland Sea, and Amigoni Estate wines. I grow Cab Franc, Cab Sauv, Mourvedre, Petit Verdot, Malbec, Chard, and Viognier. We had some really low temps lately like 9 below, I will probably get a little bud damage so I will have to deal with it.